Number One Creekside is the latest bit of real estate in our vicinity to be snapped up by developers. The owner of this popular MOT Testing Centre (opposite the Bird's Nest pub) has sold out to Bluecroft Property Development. 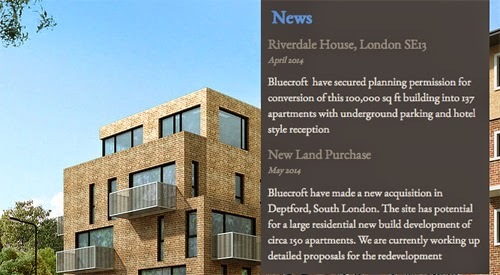 On their home page, Bluecroft announce their new land purchase (May 2014, apparently) as a site with "potential for a large residential new build development of circa 150 apartments". In an effort to distance himself from this boast, one of Bluecroft's two directors, Tom Mulligan, told us that this refers to another site in Deptford, but he wouldn't say where. So it's probably this one. With 150 flats to fit in to this medium-sized plot, it is likely there will have to be a tower block. Tom said they specialised in "Affordable Commercial", a mixed use of housing and commercial space – with the affordable emphasis on units for 'creatives' rather than homes that ordinary people can afford. Conscious that he was talking to a local artist, he was keen to show his awareness of the area already being a 'creative and small business environment'. This is also the designation for Creekside given by the Council, though this did little to stop Faircharm Estate owners Workspace cutting its affordable commercial employment space by two thirds in order to build luxury flats by the Creek. Bluecroft say it will take two to three years to work up suitable plans and they will do their best to consult with their neighbours, since they "are a small company who cannot afford refusals" – in other words, they cannot afford to appeal if planning permission is refused. It is equally true that the Council cannot afford appeals either – there is only so much they can do in the face of aggressive market interests (and practically nothing at all when Boris Johnson steps in and takes planning control from them, eg Convoys Wharf, where the GLA has bent over backwards to give the Hong Kong developer everything it wants). Anyway, just how small can Bluecroft be if they can also boast a £150m project in a secret location in the City? The north London outfit are also already ensconced in Lewisham – they include Riverdale House next on their list of recent projects. This is a bit odd since Galliard Homes are already actively promoting a whole floor of (15) properties 'off-plan' in this "all private" development (with no 'help to buy'). One way or another, Bluecroft are partnered with some big sharks. Perhaps they will operate in a similar way to Cathedral plc's Deptford Project. They 'worked with' the Council in its plans for the new station and claim to have 'worked with the community' (the train carriage and low-rent 'creative' spaces in the arches). They certainly threw some money at the area around their site, but where's their investment in Deptford now? Nowhere to be seen. Since they arrived in Deptford, they've acquired large sites in Greenwich. Building on Deptford Project aka Rise was delayed whilst they concentrated on their Greenwich High Road site, and at Morden Wharf on the peninsula they're now pretending to be terribly concerned about the future of the river (and all those terrible high rise luxury developments!). Then as soon as building started in Deptford they brought in IP Global to sell their properties overseas. See our recent post, and also the Deptford Dame's new post on local reactions to IP Global's marketing strategies. (See the video which provoked protest at the end of this post). It remains to be seen what businesses can exist and survive in the renovated arches, but the busy market and cafe culture depicted in their visuals will be in shade for most of the day. Will they be offering special rents to social enterprises? Why aren't they doing that now in another part of Deptford – and showing their on-going commitment to the area? As the ex-director of Deptford X Visual Arts festival often noted when trying to raise funding, developers only give money when they are trying to curry favour. Once they have their planning permission, the funding dries up. This year's (late) funder was Anthology – new kids on the block, and making all the right noises and showing themselves to be well cuddly. They only appear 'nice' because they're not as awful as Lend Lease or, indeed, Hutchison Whampoa. Still, even if Bluecroft intend to pretend to be friendly (quote Tom Mulligan "I come from an artists' background, so I know all about the arts"), it is blindingly obvious that development is their business and they are out to make shitloads of money (as the Deptford Dame coins it). And that is almost preferable to the deception being forged by the wolf-in-sheep's-clothing that is the owner of Number Three Creekside. Mr John Cierach (whose portfolio also includes the yard behind the Bird's Nest and the Big Red Pizza Bus) claims to be creating a "creative hub" for this little corner of Creekside and has tried to convince locals that he is "fully invested in the creative life of the area". Fully invested alright – with his secret plans to buy the Bird's Nest pub and turn it into flats (so far resisted) and his fanciful idea of building flats under the DLR viaduct (nice!). Ultimately, the issue we have with developers is that they are not building the homes that ordinary Londoners can afford. Creating balanced communities is simply not their business; their role in 'regeneration' is totally skewed. Bluecroft Property's plans may include affordable creative business units but they'll probably be the 'micro' kind suitable only for trendy mobile app designers who have been outpriced in Shoreditch. And then only because the Council have asked them to – so that they can continue to attract development money to Lewisham! But Bluecroft are under no obligation to provide any remotely affordable homes. Are they? "When the artists start coming, that's when you want to get in" Tim Murphy, IP Global. Er, they're already here, Tim, you knob, and you're pricing them out so they'll all be gone soon. 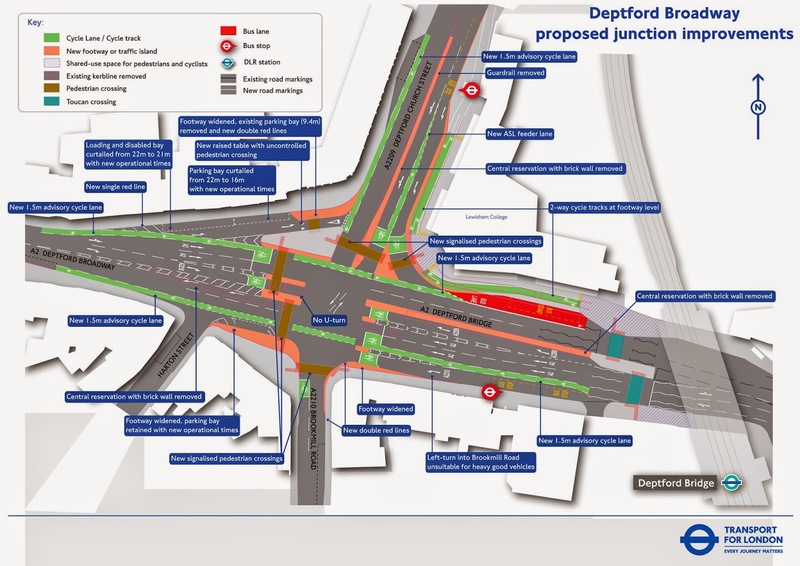 As the news goes round about the TfL consultation on their long overdue proposals for junction improvements at Deptford Broadway (see previous post), the idea of bringing trees into the equation has surfaced and is gathering wide support. A local architect has unearthed early drawings for the Seager Distillery development which were submitted to Lewisham Planning in its initial stages some years ago. This visual was used to sell the scheme to the Planners and shows trees planted in the central reservation. The scheme was later "value engineered" by a different architect to create a cheaper-to-build version of the development, and any mitigation to locals such as trees on the north side of the development was lost – perhaps in favour of the new ball courts and improvements to Brookmill Park on the south side. It may even have been difficult at the time to get TfL on board. The idea has already found traction with up-and-coming Deptford MP Vicky Foxcroft and the Brockley Society (who have a 'tree group' with experience of getting funding for new trees). Such an idea would probably have to go through Planning, but if TfL are looking at improvements here, then they need to be brought on board because it is their land. One of their proposed improvements is to remove the brick walls on the central reservations on the A2 and Deptford Church Street, so how much harder is it to put in some trees while they're at it? (See the proposals here). If you think it's a great idea, and you haven't yet completed TfL's online survey, do so now and add to the comments section that you'd like to see some trees on this busy junction (as well as pedestrian signals on every crossing) and why not trees on Deptford Church Street's central reservation too? The consultation ends 12 December. Good riddance to the worst scaffolding firm in the world! On Tuesday this week, 1st Scaffolding returned to the estate to "strike" the scaffolding they began putting up at Wilshaw House on 18th August but never completed because they were 'sacked' three weeks in. During those first three weeks they made as much noise as it is possible to make on a building site (which we are not). As we reported almost a month ago, they were given the push when MITIE, who had employed them, 'discovered' the firm was not licensed. Apparently, Ist Scaffolding have enjoyed a long term relationship with MITIE but no one has ever actually checked their credentials. How many other estates have had to endure their behaviour? A dispute followed, with residents kept in the dark about what was happening. At the end of October, Lewisham Homes' newly and specially appointed Major Works Project Manager informed a small TRA meeting (and no one else) that the preference was for Ist Scaffolding to return to finish the job rather than take it down. This would mean that the other (much quieter and more professional) scaffolding firms that have since been employed on other blocks would not have to rebuild it. It would be quicker to finish what had been started than to have it taken down and rebuilt. But this was not to be. 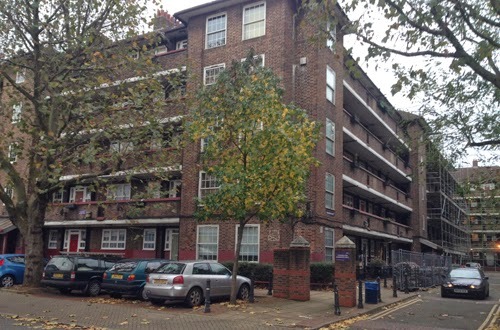 Having had unalarmed half-finished scaffolding up on their block for the past THREE MONTHS with no work actually taking place on it, Wilshaw residents will now have a brief respite before another company begins building platforms around them again – with a further predicted EIGHT months to be spent in the dark. In the intervening period, scaffolding on seven out of Crossfields' nine blocks has been completed. Wilshaw was supposed to be the first, but now they will be the last. If that was not bad enough, Ist Scaffolding's return on Tuesday at 8.15am meant more intolerable noise for residents as the men shouted their way through the dismantling job, led by their foreman – the loudest of them all. They banged and clanged as they literally threw pipes and planks to the ground. Complaints fell on deaf ears. The MITIE Resident Liaison Officer did not consider the noise a problem and was only concerned to know if the men were swearing or not. He has obviously never read Lewisham Council's Guidelines on Best Practice. Never mind that these cowboys were laughing like hyenas (the foreman especially), removing their hard hats (daring the rest of the crew to throw poles at them), singing pop tunes loudly and badly, and generally taking the piss. Despite the complaints, 1st Scaffolding continued in the same vein the following day, from early in the morning till around 3pm. No attempt was made to shut them up, and they could be heard from the main road. On Thursday morning, there was quiet, with no shouting and no pole clanging. One might have assumed they had finished the job. But no, the foreman and a much smaller crew were on site again to take down the last bits of scaffold. However, this time they were being watched by four or five management types. It seems that finally someone at Lewisham Homes or MITIE had taken notice, and it was great to see the gobby-mouthed foreman going about his work quietly, lifting poles and planks without banging them, and with his mouth clamped firmly shut for once. (However, MITIE / Lewisham Homes insist it was a different company doing the 'strike'). Unfortunately, they have left all their poles and planks piled up all around Wilshaw House – the recently dismantled ones are now added to the ones that never got put up that have been taking up valuable parking space for months. When they come back to pick it up, no doubt they will use their loud fume-emitting unsilenced diesel HGV with the engine powered hoist – because they are too lazy to lift the stuff themselves or use pulleys like the other scaffolding companies. Strange that the other companies do not have to leave their stuff here overnight like this lot. In most cases, they bring what they need and use it, only using a small space to store overnight. Lewisham Homes / MITIE gave 1st Scaffolding till 2nd December to move their stuff out of around 25 parking bays. If they didn't meet this deadline, MITIE would move it for them. The deadline was not met. MITIE promised to remove the stuff themselves on Wednesday 10th. That didn't happen either. Five weeks after the Wilshaw scaffolding was struck, the poles and planks were finally removed today (or at least most of them!). For 30 years or more, locals have been risking their lives to cross the road at Deptford Broadway – because one of the busiest junctions in London has never had signalled pedestrian crossings. Hopefully, that is now about to change, with proposed junction improvements now in consultation. The objective of Transport for London's proposed scheme is "to improve crossing facilities at the junction, enabling people to cross the road easily and safely". Hallelulah! Why has it taken this long?!!!! The Consultation opened yesterday and runs until 12 December. You can state your views by completing the online survey. • New signalised pedestrian crossing facilities on the north, west and south sides of the junction. A signalised crossing on the east side was considered, but rejected on the grounds of junction capacity and low pedestrian flows. We think that they should have signals for pedestrians on ALL the crossings! Cyclists may also have comments to make. And one local has pointed out that a tree-lined central reservation was promised as part of the Seager Distillery redevelopment. Whatever happened to that? 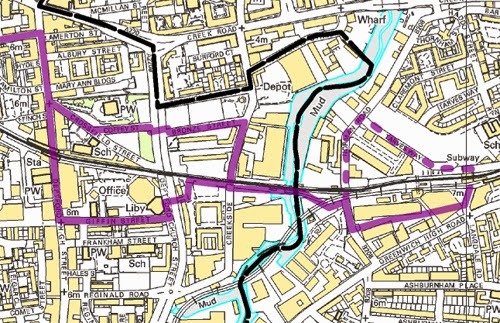 Lewisham Council is consulting on the Lewisham part of the Waterloo to Greenwich Quietway. We know this because Lewisham Homes sent us a text. No one however – not even Lewisham Homes – was consulted on the changes that have already been made to part of the route through Crossfields (see our previous post), so we're lucky to be hearing about these other plans now. However, 'consultation' ends on November 7th. 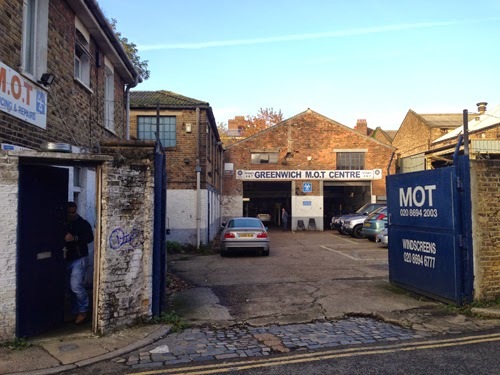 The section of Quietway that Lewisham Traffic and Parking have drawn up draft plans for involve some 'interventions' on the route between Surrey Canal Road and Creekside, as well as repairing or upgrading the road surfaces and improving lighting. For more info on the proposals see here. At our end of the route, the intention is to close Bronze Street off from Deptford Church Street as shown in this diagram, plus repaving the 'footways' and resurfacing the road and raising the entry to the road at the Creekside end. Residents of Finch & Congers Houses who drive will still have access to their carpark area, but will no longer be able to exit the estate onto Church Street. 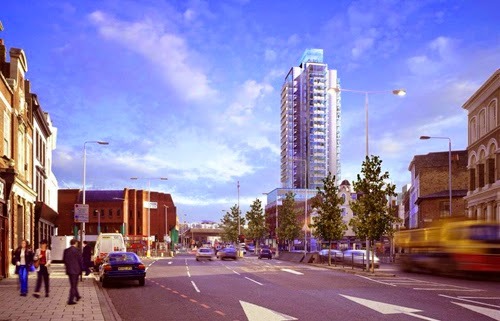 You are invited to comment on the plans by emailing traffic@lewisham.gov.uk.